The Supreme Court reiterated the settled law that execution of a Will must be held to have been proved not only when the statutory requirements for proving the Will are satisfied but the Will is also found to be ordinarily free from suspicious circumstances. The Supreme Court held that while considering the territorial jurisdiction over a derivative suit initiated to protect the beneficial interest of a company, the issue qua the existence of such an interest can only be decided on the condition that the said company is amenable to such a jurisdiction. The Supreme Court observed that even a long delay in registration of First Information Report (FIR) can be condoned if the witness has no motive for falsely implicating the accused. The bench comprising Justice R. Banumathi and Justice Indira Banerjee was considering an appeal against conviction of one Palani in a murder case. The Supreme Court held that consumer complaints by ‘subsequent transferee’ of flats are not always barred. The bench comprising Justice Uday Umesh Lalit and Justice R. Subhash Reddy clarified that the decision in Haryana Urban Development Authority v. Raje Ram cannot be stretched to say that in every case where there is a transfer, the complaint by the subsequent transferee would not be maintainable at all. The Supreme Court upheld a full bench order of the Allahabad High Court turning down a reference to it seeking to examine correctness of a division bench judgment which was approved by the apex court. The Supreme Court observed that even a third party to the proceeding, if he considers himself an aggrieved person may take recourse to the remedy of review petition. The bench comprising Justice Kurian Joseph and Justice AM Khanwilkar observed thus while disposing a review petition filed by Union of India against a 2011 judgment in National Textile Corporation Ltd. Versus Nareshkumar Badrikumar Jagad. The Supreme Court observed that before an investigation is complete, a high court, in a petition filed by the accused under Section 482 CrPC, could not go into the aspect whether there was requisite mental element or intention on part of the accused. The Supreme Court held that, before awarding death sentence, a proper psychological/psychiatric evaluation is to be done by courts to assess probability and possibility of reform of the criminal. A three-judge bench comprising of Justice Kurian Joseph, Justice Deepak Gupta and Justice Hemant Gupta commuted death penalty awarded to a man convicted for murder of three persons. The Supreme Court on Tuesday held that the development activities, including the industrial areas fall within the scope of the authority under the Karnataka Town and Country Planning (KTCP) Act and the industries, while obtaining the approval from the authority for its plan, is bound to pay the betterment charges, road cess and other charges as per the laws. The Supreme Court observed that even after disclosure is made by a candidate about criminal cases pending against him, the employer would be well within his rights to consider the antecedents and the suitability of the candidate. The Supreme Court observed that when a large number of posts are lying vacant and selection process has been followed, then the employer must satisfy the court as to why it did not resort to and appoint the selected candidates, even if they are from the replacement panel. The Supreme Court commuted death sentence imposed on a man convicted in a triple murder case, in which the victims were minor children. The bench comprising of Justice N.V. Ramana, Justice Mohan M. Shantanagoudar and Justice M.R. Shah observed that though the offence has undoubtedly been committed which can be said to be brutal but it does not warrant death sentence. Motor Accident Claims: No Restriction In Awarding Compensation Exceeding The Amounts Claimed By Claimants [Ramla & Ors. V. National Insurance Company & Ors. There is no restriction to award compensation exceeding the amount claimed by the claimants, the Supreme Court held. The bench comprising Justice N.V. Ramana and Justice Mohan M. Shantanagoudar in Ramla vs. National Insurance Company Limited upheld the compensation awarded by the high court, but said that it should not have deducted 2/3rd of the total income towards the personal expenses of the deceased, while quantifying the compensation. 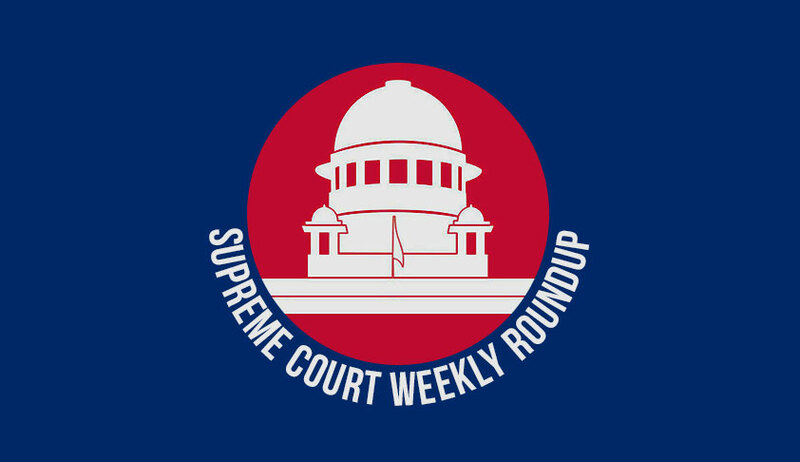 The Supreme Court reiterated that when the appointments were illegal and void ab initio, the question of regularization of their services by invoking the judgment in Umadevi case does not arise. The bench comprising Justice Madan B. Lokur, Justice S. Abdul Nazeer and Justice Deepak Gupta allowed appeal filed by the State of Bihar against the Patna High Court order directing reinstatement of many employees in service in a primary health centre. The Supreme Court held that silence on the part of the accused as to questions put to him by the court under Section 313 of the Code of Criminal Procedure, in such a matter wherein he is expected to come out with an explanation, leads to an adverse inference against the accused. The Supreme Court on Monday, asked the Central Pollution Control Board (CPCB) to initiate prosecution against government officials who have not acted on 249 complaints received on its official social media and e-mail accounts with regard to pollution in Delhi. A bench of Justices Madan B Lokur and Deepak Gupta said that officials who have failed to act on the complaints were required to be prosecuted. In pursuance of its earlier observation that the Bihar local police “is not doing its job as expected”, the Supreme Court bench headed by Justice Madan B. Lokur on Wednesday transferred to the CBI the investigation into the allegations of sexual abuse of the residents of 16 children’s homes in the state. The Supreme Court on Tuesday granted conditional stay of the judgment of the High Court of Kerala which had invalidated the election of K M Shaji from Azhikode constituency and disqualified him for six years on the ground that he made communal remarks in the run-up to the assembly polls in the state in 2016. The Supreme Court, on Thursday, imposed costs of Rs. 50,000 on the governments of States which had not been cooperating with the Centre in supplying information on filling up vacancies in their Forensic Science Laboratories. The Supreme Court dismissed the review petition filed against the judgment dated October 16, 2015, of the Constitution Bench that struck down the National Judicial Appointments Commission (NJAC) Act of 2014 and upheld the collegium system for appointment and elevation of high court and apex court judges. The Supreme Court on Thursday allowed the candidates who are 25 years of age and above to apply and appear in the NEET-UG 2019 examination. The bench comprising Justice SA Bobde, Justice L. Nageswara Rao and Justice R. Subhash Reddy issued the following interim order in the Special Leave Petitions filed against a Delhi High Court judgment. The Supreme Court on Friday rejected the plea of over 300 Army personnel challenging the lodging of FIRs against soldiers involved in operations in Manipur and Jammu and Kashmir, where AFSPA is in force, though the Centre contended that it will have a “demoralising effect” on soldiers who are fighting terrorism. The Supreme Court on Tuesday asked the Chhattisgarh government to apprise it of the status of investigation in the murder case registered against social activist and Delhi university professor Nandini Sundar and others in three weeks. The top court asked the state government to enumerate steps it propose to take in the case against Sundar and others.